Denise calls this photo The Passage of Time, which makes sense, since we feel like we could look at it forever. Denise Gomez Markowski is a fortean photographer with an eye for the unusual whose intuitive nature gives her a unique insight into the lives of others—something which she credits with making her a more empathetic person. "I have always been a very intuitive person," she told us. "I can walk into a room and just feel its energy, meet complete strangers and immediately know how they are feeling. It’s a blessing and curse. Death seemed to linger around during my youth. I lost a close childhood friend to suicide when I was in junior high school. My intuition and grief of watching friends and acquaintances around hurting inspired me to become a good listener and help others." Denise tried studying psychology in college, but said that one day she woke up to find that she had simply lost all interest in pursuing her degree. She quit school and instead began to experiment with art. "I began to experiment with sculpture, photography and jewelry design," Denise said. "With a background in psychology and inspired by my personal experiences, I began to express within my work the subjects that most people fear—death, loneliness, nightmares, love, memories, success, failure and the unknown." Those subjects aren’t without controversy, but Denise never let that stop her from finding her zen in cemeteries. "Some have viewed my cemetery photography as too morbid or offensive," Denise admitted. "There is something about cemeteries that I find beautiful. Cemeteries were actually our first public parks. It’s the one location in any city where life, death, nature and culture intertwine. Many are uncomfortable with the subject of death, only visit cemeteries for funerals and avoid them after. For me cemeteries are the perfect solitude. Visiting and photographing cemeteries provides me with clarity, peace of mind and a connection to spirituality. I absolutely love exploring forgotten history, the untold stories of people and their surroundings." All of that time in cemeteries has led to at least one brush with paranormal activity and an interesting confirmation from Denise’s husband. "I live on the Southside of San Antonio, Texas; home to many historical landmarks and urban legends," Denise explained. "I was out with my husband photographing the Missions of San Antonio and we decided to visit the Loma China Cemetery, also known as the Chinese Graveyard. It’s a very small unkempt cemetery with the front gate always locked. Well this time the side gate was left open leaving me tempted to wander the grounds and explore." "As my husband and I were walking the grounds and looking at the tombstones, I heard what sounded like two children laughing and playing happily," she continued. "Their laughter rushed past behind me in midair. I felt their energy all around but did not say a word to my husband. I told him in the past about some of my encounters. He never disbelieved or believed, he just never had a paranormal experience before. Seconds after the sound of laughing children, my husband looked at me with a surprised look and said, did you hear that?" 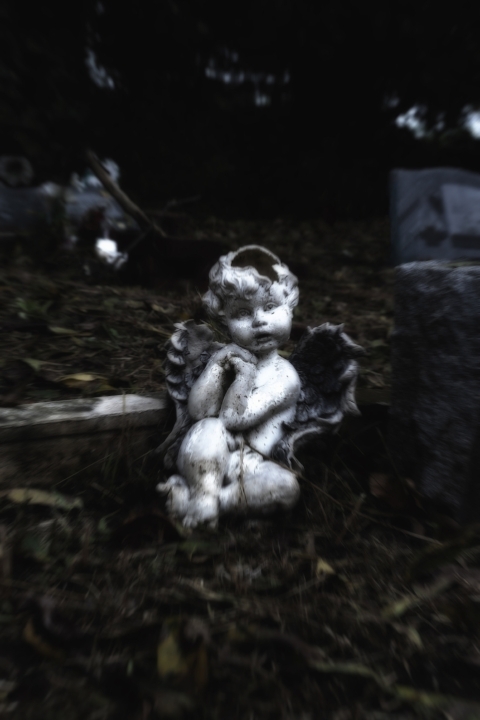 Naturally, ghosts and urban legends are the subjects closest to her heart, but Denise stays open-minded about the breadth of fortean phenomena. One urban legend in particular has stayed with Denise over the years. Denise was honored recently to find some of her photography had been chosen to be featured in The LeoniArt Project International Exhibition of Visionary Art in Genoa, Italy at the historic Palazzo Doria Spinola. The exhibition runs this year from November 15th – 30th. "Having my photography selected to be part of an International exhibit has been a real eye opener. I feel a sense of confidence and gratitude for all the hard work, effort and intention that I have been putting into my work over the years," she said. Her humility is matched only by her talent, and it’s certainly no surprise that people anywhere would be as excited about her work as we are. Denise’s attitude and advice embody her fearless and empathetic spirit, and we certainly expect to see more great things from her in the future. "Nothing is as it seems," she offered. "Don’t be afraid to explore, experiment, and create without boundaries." You can, of course, find Denise in our art portal, or see more of her photography at her website. If you’re in the market for handcrafted jewelry, we recommend checking out her Etsy shop.